A killer is at large after a man was fatally shot this morning near Oneida Avenue and Chamberlain Street. A shooting was reported around 1:30 am and upon arriving at the scene, police found a man suffering a gunshot wound, said Los Angeles Police Department officials. Police believe the victim was visiting a friend in the neighborhood, which is one block away from San Fernando High School. The victim’s friends were cooperating with police, according to KTLA, but police have no description of the shooter or vehicle involved. 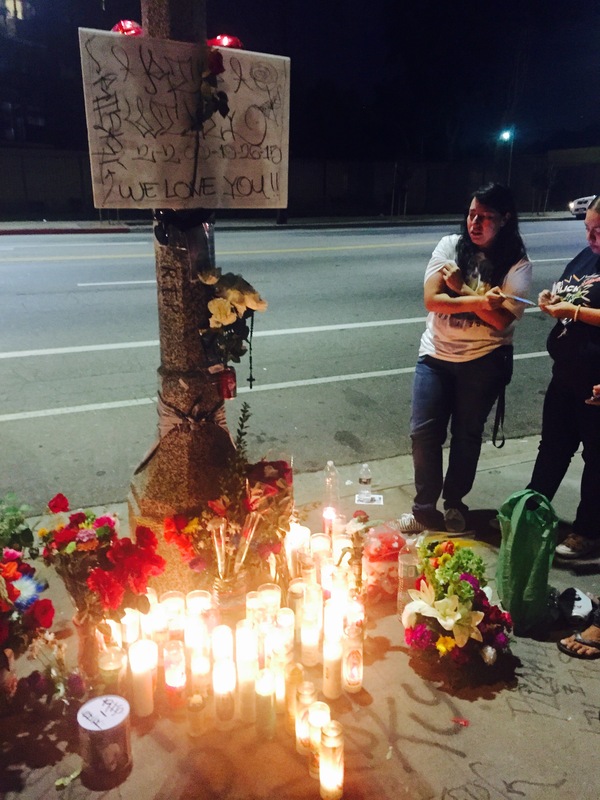 Willy Barrios’ friends and schoolmates gathered for an unplanned vigil Tuesday evening. 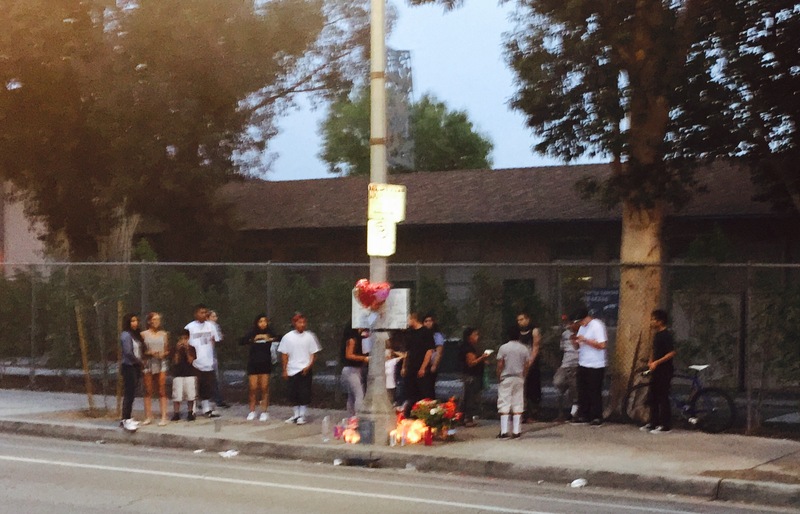 A group of nearly 15 teenagers gathered Tuesday evening on Van Nuys Boulevard by Pacoima Charter Elementary to hold a vigil for their friend and schoolmate Willy Barrios, who was found dead there Monday morning. “This wasn’t a regular murder; this was some guys wanting to start something,” one of them said. Community members stopped by the memorial to leave flowers and candles for the 15-year-old killed Monday morning. financially help out his mother, and every day after school he would walk or ride a scooter to San Fernando High School to visit his girlfriend. As far as they all knew, Barrios was not in any gang, they said. They cannot understand why he would be targeted. According to police, Barrios was shot in the head with a semiautomatic weapon by two suspects who fled on foot. No suspect has been arrested, and police are still investigating the case. A woman at the vigil gave her version of the story, saying the boy was visiting his cousin, woke up late, and stopped by the nearby 7-Eleven store nearby to buy something to drink before heading home on foot. As he left the store he noticed two guys following him so he ran, fell, and that is when the murderers killed him. The teenagers had a different story. According to one of the teenagers who said to have known Barrios since middle school, police detectives told the group gathered at the vigil that Barrios was drinking at his cousin’s house. His cousin fell asleep, and Barrios, drunk and bored, walked across the street to David M Gonzales Park where he fell asleep drunk. Barrios was then taken by homeless persons who saw him passed out drunk to Los Angeles Fire Station 98, where he woke up startled and fled. A few minutes later, Barrios was killed. Neither the Los Angeles Police Department or Fire Department would confirm that Barrios was ever at the Fire Station. At the scene, community members built a memorial of flowers and candles. The nickname “Risky” could be found at his memorial, yet it was not confirmed if Barrios went by that alias. 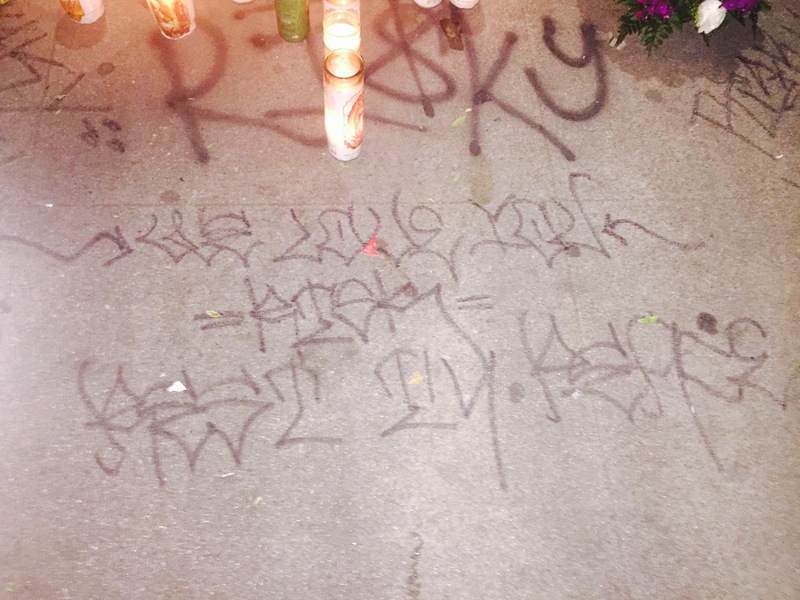 Notes are posted on a lamp post saying “You will be missed” and graffiti markings on the ground read “We Love You Risk Rest in Peace.” Although the nicknames “Risk” and “Risky” are used, it could not be confirmed that Barrios went by those names. “People in the community does care,” said a young mother as she rushed away after dropping off half a dozen white candles. Nearby, one of the teen’s father was waiting in his car in case anyone needed a ride, not wanting them to walk home. “He’s not the first, and he’s not the last one,” they said. No person has been arrested for the shooting yesterday near Van Nuys Boulevard and Arleta Avenue, which means the assailant is still at large. The shooting occurred October 27 around 3:45 p.m. near the intersection after the victim, who was in his vehicle, and the suspect, who was on foot, exchanged words, said Sergeant Carlsen from the Mission Police Station. She said the victim and suspect, described only as a Hispanic male, are from rival gangs. The victim was wounded on his left arm but managed to drive himself up Van Nuys Boulevard and parked in front of the McDonald’s across the street from Mary Immaculate Church. He was transported to Holy Cross Hospital, where he is now in stable condition.